The "Interstellar" exhibition by Paramount Pictures, IMAX and Oculus Rift gives an immersive look inside the Endurance spaceship featured in the film. Pictured here, a view down a long corridor on the way to Endurance's cockpit. NEW YORK — Grab your spacesuits, space fans. The folks behind "Interstellar," arguably the most anticipated space film of the year, are offering a sneak peek inside the movie's centerpiece spaceship Endurance. And all it takes is a few minutes of your time. For a limited time, Paramount Pictures and IMAX are inviting the public to take a free three-minute tour of the Endurance in a special traveling exhibit that began its cross-country tour today (Oct. 6). The experience uses the Oculus Rift Development Kit 2 to transport space fans aboard the Endurance virtually, allowing a truly immersive ride aboard the fictional spacecraft at the heart of "Interstellar." Space.com managing editor Tariq Malik visits the Endurance spacecraft, featured in the film "Interstellar," in a virtual experience created by Paramount Pictures, IMAX and the Oculus Rift Development Kit 2. I had the chance to test drive the virtual reality experience first-hand, and to call it immersive is an understatement. From spectacular views of Saturn and stars in the windows to the Endurance interior itself, the amount of attention to detail is incredible. A shift from a spin-induced gravity to "weightlessness," in particular, was as surprising as it was amazing. 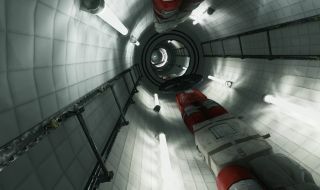 "I was impressed with how the experience is able to put you in the cockpit of 'Interstellar's' spaceship, the Endurance," Nolan said in a statement. "It was just like being back on set." Chantilly, Virginia (Nov. 5-19): Smithsonian Udvar-Hazy Center (home of NASA's Space Shuttle Discovery). The "Interstellar" Endurance experience will be open at its designated theaters from 11 a.m. to 11 p.m. on exhibition days, and is free on a first-come, first-served basis. While "Interstellar" will be released in theaters nationwide on Nov. 7, Paramount is unveiling the film in IMAX format a full two days early, on Nov. 5, in advance screenings in 240 theaters across the United States. You can learn how to reserve tickets for those advance screenings at http://interstellar.withgoogle.com, as well as at the websites of the individual participating theaters.